We’re excited to announce the launch of the Televac MX7B, a new active vacuum gauge that utilizes the well-known Televac 7B Penning cold cathode gauge to provide contamination-resistant, repeatable, and accurate high vacuum measurement. Read the full press release here. The MX7B cold cathode gauge is easily disassembled for cleaning and gauge replacement to save users time and money. This digital vacuum gauge includes a multi-color OLED display, a configurable 0 to 10 V analog output for vacuum measurements, digital RS-485 and USB communications, and a set point relay and open collector for process control. The MX7B can also be connected to an EthernetIP network via the new Televac MX Active Gauge EthernetIP Gateway, the first and only solution designed to provide EthernetIP communication between Televac active vacuum gauges and Rockwell Automation® Allen-Bradley® PLCs. For more details, download the MX7B datasheet. Designed for harsh environments, the MX7B’s Penning cold cathode gauge is more resistant to contamination than inverted magnetron gauges, meaning it requires less maintenance, minimizing downtime and maintenance costs for end users. Like all MX-series active vacuum gauges, all features of the MX7B are accessible through the front panel display or digital communications, simplifying things like calibration, which can now be done remotely through a PC, PLC, or HMI. The MX7B active vacuum gauge is designed for the vacuum furnace and heat treat, thin film coating, and e-beam welder markets, as well as for existing MP7ER cold cathode gauge users and other active vacuum gauge users. The diagram below illustrates a typical configuration for full range vacuum measurement for a vacuum furnace system. What is an Active Vacuum Gauge? 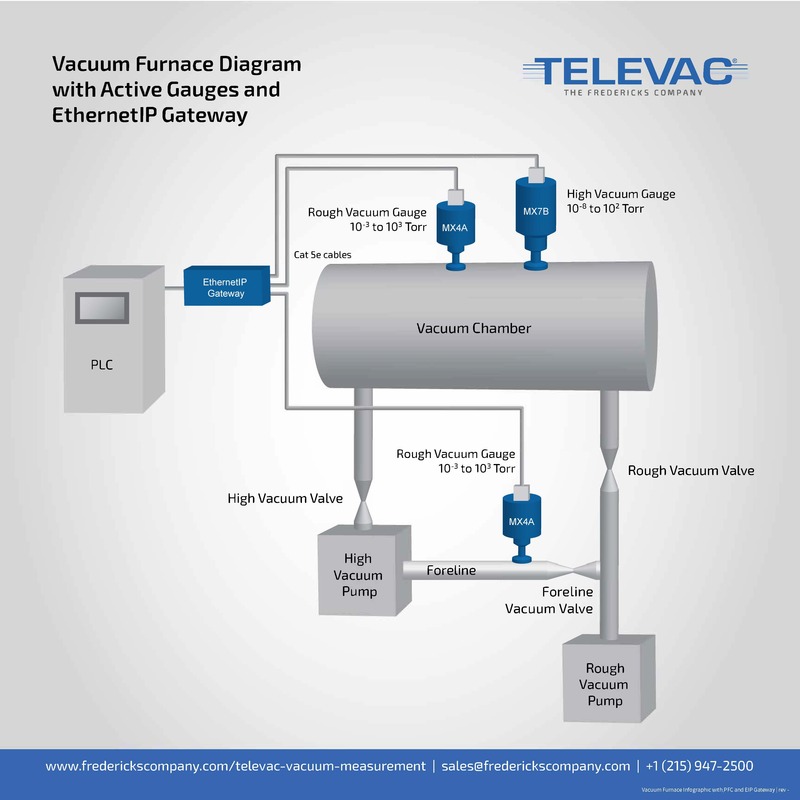 In the vacuum industry, “vacuum gauge” and “vacuum sensor” are synonymous and are used interchangeably to describe the passive sensing component that’s connected to vacuum. A passive vacuum gauge needs controlling electronics to convert the electrical signal from the gauge into a pressure reading. 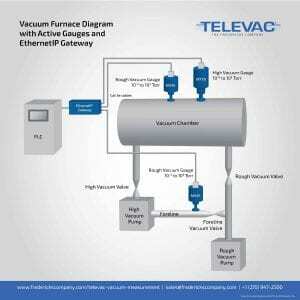 This conversion is done by a vacuum controller like the MX200 (which controls up to 10 sensors at a time), or the control electronics are integrated into an assembly which is directly attached to the sensor, making what we at Televac call an active vacuum gauge. Not sure which option is right for your application? We can help find the right vacuum measurement solution for you! Use the live website chat, call us at +1 215-947-2500, or contact us here.